Going on vacation this summer? Don’t forget about your teeth! As your travel buddies, they require just as much care and attention on the road as when you are home. 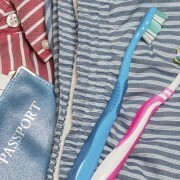 Here are 9 tips to help prevent dental complications while travelling. Packing a toothbrush, toothpaste and floss goes without saying, but don’t forget to bring other dental accessories that you may use, such as a mouthguard, mouthwash, floss threaders for braces, etc. Travel size dental products are really convenient and allow you to travel light. Traveling with an electric toothbrush? Be sure you have an adaptor for it! Consulting your dentist before travelling is always a good idea. Ask for a thorough exam so that your dentist can spot any problems before they become potential emergencies. Most dental problems can be solved quickly, while the more complicated treatments can often be postponed until your return. A wet toothbrush can breed bacteria. In your travel bag, make sure your toothbrush is covered, in a travel container or resealable Ziplock bag, to keep the bristles clean and out of touch from other objects. As soon as you reach your destination, take your toothbrush out of its travel container and let it air dry. If you forgot to pack your toothbrush or toothpaste, don’t worry! You can always grab a new toothbrush at the hotel front desk or at the nearest drugstore. If dental products really aren’t available, rinse your mouth profusely with water to wash away some of the bacteria. If the local water is compromised or simply unsafe to drink, you shouldn’t use it to brush your teeth and rinse your mouth. Bottled or boiled water are safer options wherever you are. Although constant gum chewing is not recommended, you can make an exception while traveling. On vacation, you can’t always brush your teeth after every meal, and therefore chewing sugarless gum will help neutralize the acids in your mouth and increase the flow of saliva, allowing for food debris to be washed away. Keep your dentist’s phone number or business card on you. You’d be surprised by how many dental emergencies can be resolved over the phone! If you are visiting family or friends, ask them to recommend their local dentist. Your hotel’s concierge can also recommend a good dentist. If you have travel insurance, the company’s hotline can refer you to a qualified dentist, and even provide translation help if necessary. In any case, try calling the clinic beforehand to make sure that it follows standard hygiene regulations, such as using new gloves for each patient and sterilizing instruments. Let’s be honest: we all get a little lazy with our teeth on vacation. We skip flossing or brushing a couple of times, and indulge in sweets and sodas. But don’t let these temporary bad habits become permanent ones! Get back to your dental routine of brushing and flossing to make sure your pearly whites remain healthy. If you’ve experienced any problems or complications, we recommend you see your dentist when you return. If you’ve consulted another dentist during your trip, ask to have your file transferred to your dentist back home, so that he or she can remain updated on your oral health. Plus, us dentists love hearing all about your adventures abroad! Prevent dental complications abroad by following these simple tips. Invest time in talking to your dentist before your departure so you can enjoy your holiday to the fullest. And don’t forget to send us a postcard!